The Paris Agreement laid out the path to an ambitious future —a net-zero emissions, climate-resilient world. But there are still a number of tasks that must be completed in order to put the world fully on course for that journey. Negotiators in Bonn, Germany must begin serious work this week on those key tasks and start developing the rules, processes and guidelines for how the Paris Agreement will deliver the goals it’s promised. 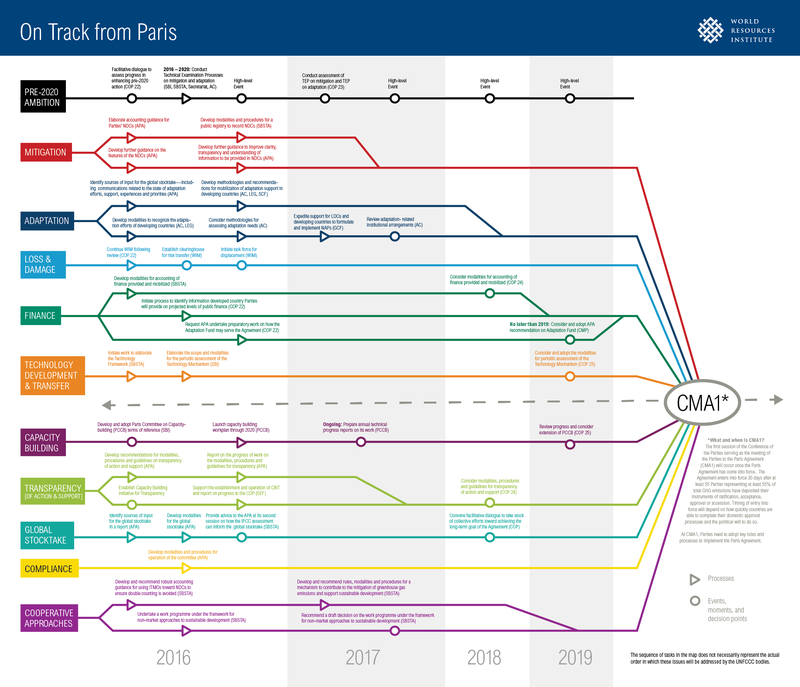 To aid those discussions, WRI created On Track from Paris, a map that outlines outstanding work areas for 10 key “tracks” of the Paris Agreement—tasks that must be completed by the first meeting of the Parties to the Paris Agreement (CMA1). The associated working paper, Staying on Track from Paris: Advancing the Key Elements of the Paris Agreement, provides an even more detailed to-do list to help break down these tasks into smaller, more manageable pieces. Before CMA1, negotiators will need to develop procedures for at least 10 tracks of the Agreement: mitigation, adaptation, loss and damage, finance, technology development and transfer, capacity building, transparency, the global stocktake, compliance and cooperative approaches. While the timing of CMA1 is uncertain, it could come sometime in the next two years. Plus, many of the key rules must be developed and presented to Parties no later than COP24 in 2018. Nationally determined contributions (NDCs), countries’ national climate plans, will be the main vehicle to drive mitigation ambition, and the rules to guide them will be essential. When countries come together at CMA1, they will need to adopt rules and guidelines for NDCs, which must be submitted every five years and will be informed by a global stocktake. Parties will need to issue guidance on what future NDCs should look like; what information countries should provide to make sure their NDCs are understandable and transparent; and how countries should measure their greenhouse gas emissions. Whatever rules negotiators establish should build on the existing guidance agreed to in Lima in 2014, while also requiring countries to be more specific about their assumptions and any methodologies used to develop their NDCs. In addition, Parties must also consider whether to agree to a common timeframe and end-date for new NDCs. The Paris Agreement puts adaptation and addressing climate impacts at its core, and outlines a process for Parties to periodically communicate their domestic adaptation priorities, implementation plans, and support needs. Parties must now determine by CMA 1 how to recognize the adaptation efforts of developing countries and how to assess their adaptation needs. Additionally, this track will need to clarify how countries should communicate their adaptation efforts internationally and what comes next for NDCs’ adaptation components. Critically, any guidelines should help align the various ways that countries communicate on adaptation, allowing a clear understanding of what countries are facing and what they need. These decisions will be important for ensuring international support for the actions countries take to build their resilience to climate impacts. 1) Developing accounting rules and processes for climate finance. Developed countries committed to mobilize $100 billion a year in climate finance by 2020, but lack of agreement on what counts has made it difficult to assess progress. Agreeing on accounting rules and processes by 2018 will help in determining progress towards future finance goals, including for adaptation finance. 2) Identifying the information developed countries will provide on projected levels of public finance. Like a good train timetable, having useful advance information on finance will improve predictability and allow developing countries to make longer-term, transformational plans. Parties will need to decide which negotiating body to assign this task— most likely either the Ad-Hoc Working Group on the Paris Agreement (APA) or the Subsidiary Body for Scientific and Technological Advice (SBSTA) – and then proceed apace to establish guidelines. 3) Looking into ways the Adaptation Fund, created under the Kyoto Protocol, could serve the Paris Agreement. Like trains running on different track gauges, there are technical issues to address before the Adaptation Fund can run on the Paris Agreement’s tracks. Extending the Adaptation Fund beyond when the Kyoto Protocol’s second commitment period ends in 2020 could provide much-needed support to developing countries building resilience. These are just three of the many tracks to be completed before 2020. For recommendations and suggestions for advancing these issues, please see the working paper. The world rightly celebrated when 195 countries adopted the Paris Agreement last year, but it will only be as effective as the rules, guidelines and processes that govern it. Negotiators, together with wider stakeholders, do not have to start from scratch. They should build their tracks on top of the lessons and best practices they’ve learned from the more than 20 years’ of UN climate negotiations. With the right rules in place, we can ensure all countries actually get to the future we want—a climate-resilient and prosperous world for all. After COP21: What Needs to Happen for the Paris Agreement to Take Effect?